The classic thriller, Dracula, by Bram Stoker and adapted by Christopher P. Nicholas was presented, for one weekend only, to sold-out crowds by Oregon Children’s Theatre’s youth company, Young Professionals. It was directed by James Sharinghousen (recently seen as an actor in Triangle’s Avenue Q). Although this only played for one weekend, it’s worth noting because it is presented by a company of youth, both in the acting and behind the scenes. These young people are from their school and are a good example of what young people are capable of when trained by a quality school/theatre such as OCT. They are also presenting, for a second time, A WWII Radio Christmas, December 8th-16th, which sold-out last year (hint-hint). Call 503-228-9571 for tickets or go to their website www.octc.org for more information on classes and shows. This is, indeed, one of the classic horror stories of all time. Although tales of vampires had been around before this, Dracula firmly cemented them into the minds and hearts of readers/viewers everywhere. And this stripped-down, hour-long model of the story adds enough suspense to make it a worthwhile experience. The story should be familiar to most. In this version, Mina (Anne Parham) is a guest of Dr. Seward (Hannah Wilson), and her assistant, Snelling (Michael Cline), in his institution. She has a strange malady, which not only physically weakens her but gives her strange hallucinations, as well. Even her fiancé, Jonathan Harker (Martin Tebo) is at wit’s end as to what to do. Enter Professor Van Helsing (Stephanie Roessler), a highly respected doctor to discover the problem and solution, which has nothing to do with earthly science. She discovers that one of the patients, Renfield (Carter Bryan) has a strange connection to Mina, seeming to sense the evil surrounding her. And, of course, the mysterious Count Dracula (Jeremy Howard), a recent transplant from Eastern Europe, lurks in the background. As mentioned, this is a stark production and only has one setting (Dr. Seward’s office) with a minimal cast and a short time period to chill the viewer. Therefore, much of the adventuresome story is lost and/or changed to fit these criteria. But that doesn’t diminish the strength of this presentation. It relies more on a story-telling technique to get across its point rather than elaborate pageantry, in which often the tale gets lost, smothered by effects. The direction, by Mr. Sharinghousen, since he has such a limited environment, tends to accentuate the little things to create tension. The cat-and-mouse circling of the Count and the Professor; the seductive blood connection between Dracula and Mina; the puppet-like gyrations of characters; and the eerie, vacant stares toward the audience at the end, are quite effective measures of suspense. 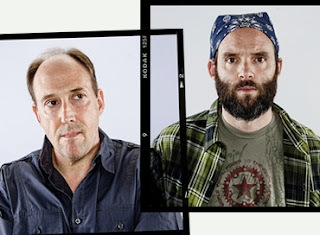 The entire cast is very capable in their depiction of the characters. And I highly approve of the cross-gender casting in the characters of Van Helsing and Seward. Neither gender (nor culture, nor age) should ever be a factor in not casting the best person for the part. In the final result, Art will prevail. Mr. Howard, as Dracula, has a difficult task, competing with the likes of able performers such as Jack Palance, Gary Oldman, Frank Langella, Christopher Lee, and, of course, Mr. Lugosi, himself. But his boyish good-looks and underplaying the menace, gives him a boy-next-door persona, which is all the more scary. Dare I say it, you almost like him at times. Ms. Parham, as Mina, is quite effective in playing the duplicity of her character, traversing the difficult path between good and evil with ease. And, especially prominent, is Mr. Bryan, as Renfield. The Jekyll & Hyde presentation of this role is a delicate balance between madness and sanity and he walks this tightrope with remarkable dexterity. Probably the most complex character in the story and performed very well. If they revive this for next season, it would be well to remember that his would not be recommend for young children, as the story may be too intense for them and there is some onstage blood spilled toward the end. If you do see a production by this troupe, tell them Dennis sent you. 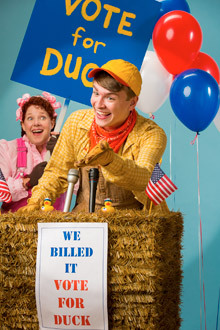 Duck For President, a musical by James E. Grote and George Howe and directed by Kirk Mouser, is now playing at the Newmark Theatre in downtown Portland. It is presented by Oregon Children’s Theatre, now in its 25th year in operation, and arguably one of the best children’s theatre/schools in the area. It plays through November 4th. Check their website www.octc.org for more information. The play is, I’m sure, not an accidently choice, being this is an election year. Although the script is somewhat lightweight in the satirical aspects, it is an excellent source for young people’s exposure to the political workings of our system. And the youth in the audience were quite animated in their pleasure of this production. The story concerns Farmer Brown (Joshua Stenseth) who is the leader of the farm and really a pretty fair boss. But the rest of the animals, especially Duck (well-played by Hogan Fritz), feel that he is working them too hard. All they really want to do is play. So Duck convinces Cow (Haley Ward), Pig (Emily Sahler Beleele) and Hen (Ashlee Waldbauer) that he should run for Farmer, since that is the democratic way of doing things in this country. He makes promises that life will be easier for them if he is elected. Any resemblance to current situations in politics is, I’m sure, entirely…intentional. He discovers that being the boss of a farm is not so easy, but he feels his real calling is to be Governor. When that becomes a fact, he decides to run for…you guessed it…President. The conclusion is rather touching and, like Aesop’s fables, may have a moral: Maybe the grass is not always greener on the other side. But, like Dorothy from Kansas, you have to go over the rainbow before you can appreciate what you have at home. Boy, are we a stubborn breed, or what?! The music and dance numbers lend themselves very well to the story and the young people are easily up to the challenge. Mr. Mouser has led this team to a very energetic and enjoyable performance. And the costumes by Dani Baldwin (OCT’s Education Director) lend well to this production, never overshadowing the actors, but complimenting what they do. The performances by all are first-rate. Mr. Stenseth, as the Farmer, plays multiple characters and does them all very well. And Ms. Beleele, as Pig, has some outstanding moments as the lead in the song, Hitch Your Wagon to a Star (at least I think that’s the name of the number, as they’re not listed in the program). The band was also exceptional, although a bit overpowering at times and drowning out the singers. But the highlight of the show was Haley Ward, as Cow. Her belting of the number Whatda Think (?) was a showstopper. Her bio states that she is just beginning her entrance into theatre. If she lives up to the performing she did in this show, she has a long and prosperous career ahead of her. Bravo, Haley! I do recommend this show and their school for young people. The Youth of this world need artistic outlets like this. It builds character, confidence and teamwork. And it exposes one, in a safe environment, to the world of…Imagination, a Land of never-ending possibilities…a Place where one can explore, discover, nurture and grow to one’s full potential. “The world is too much with us,” the poet said. As adults, that may be true. But in the World of Youth, one can still Dream…and in dreaming, shape who we want to become. This production is one step in that direction. I recommend it. Tell them Dennis sent you. August Wilson is recognized by the theatre community as one of the best playwrights of the last few decades. His ten-play cycle, outlining the life and times of Afro-Americans, is quite impressive. 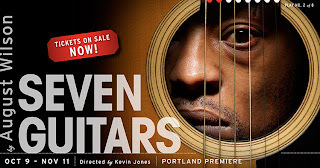 Seven Guitars is in the middle of that cycle, the 1940’s, exposing the lives of seven individuals in the Hill district of Pittsburg, PA. (the seven guitars?). We had our own Hill district, in the guise of Vanport, until it was destroyed by a flood. It was probably a reflection of the Black experience, like the Hill district of PA. People living in poverty, haunted by their own demons of the past, dreaming of a better tomorrow. A world dominated by White oppression, steering the lives of all involved. The play is told as reflections and semi-monologues on each of these characters’ lives. It begins with six of them coming back from the funeral of Floyd (Lance Mc Queen). He has been murdered, and the rest of the play is a flashback of his life, leading up to his death. This is not Wilson’s best play but the explosive efforts of his characters to tell their story outweighs the lack of a strong, narrative thread. Floyd is a bit of a gad-about, a fly-by-night musician, whose sole purpose seems to be to become rich and famous. His “main squeeze,” when his hands aren’t wandering, is Vera (Ramona Lisa Alexander), a lady who, perhaps, loves “not wisely but too well.” His musician friends are Canewell (Victor Mack), a glib lady’s man and Red (Michael J. Asberry) a reflector, perhaps, of the human condition. There is Vera’s wise-cracking friend, Louise (Gayle Samuels), a no-nonsense lady who seems content to be in charge of her world. She has a niece, Ruby (Ashley Williams), a young flirt who comes to live with her, seeming to live and revel in turning the heads of all men. And the bible-spouting neighbor, Hedley (Mujahid Abdul-Rashid), a man with a very damaged childhood but feels destined to come into riches owed to him, and to father a new messiah. These characters are richly drawn by all the members of this powerful ensemble. Each of them having their moments to expound on their dreams and fears in monologue-type expositions. And each of their traits are expertly told by the performers and universally recognized by the audience. It is all of us, richly detailed by the genius of Mr. Wilson, Mr. Jones and the cast. The set by Jeff Seats is a marvel. It is so realistic it becomes a character unto itself. You could almost feel yourself walking through their doors and into another time period. And the costumes by Jessica Bobillot also add colorful flavor to this mix, especially in the last act with the rich hues of their fancy attires. Kevin Jones’s direction is precise and crisp, moving the play along when it needs the quicker pacing and more slowly for the subtler moments. He is an actors’ director, obviously taking care with searching out all the possible nuances of a character. The strength of Mr. Jones (and Mr. Wilson) is presenting us with people who are all shades of gray, without recriminations, and are very much like the sum total of all of us. I recommend this show. And, if you liked it, watch for other Wilson plays this season in Portland. 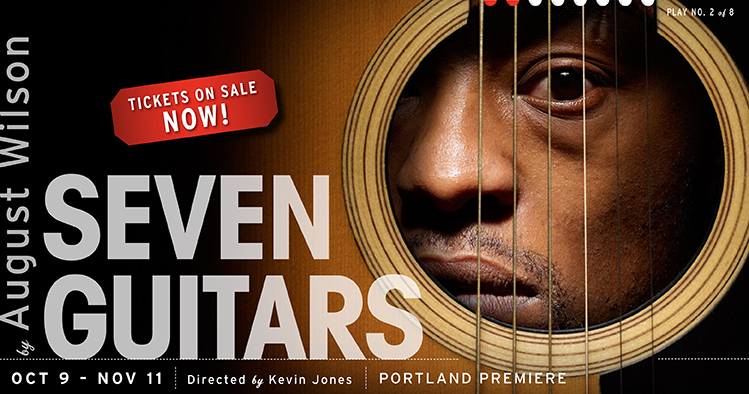 King Hedley II at Portland Playhouse in December and Two Trains Running at OSF in Ashland this Spring. Tell them Dennis sent you. The Body of an American is in PCS’s Ellyn Bye Studio, at 128NW 11th in the Pearl District of Portland. It plays through November 11th. It is written by Dan O’Brien and directed by Bill Rauch (OSF’s Artistic Director). Check out their website www.pcs.org for further information, play dates/times and ticket prices. Essentially the story is about the relationship between two men, Dan O’Brien, a writer, and photojournalist, Paul Watson. At the heart of the saga is a photo of a dead, desecrated, American soldier in Afghanistan taken by Watson. Before he took the photo, it purportedly spoke to him saying, “If you do this, I will own you!” And he is haunted through the rest of the play by these prophetic words. Paul (William Salyers) is a reporter and photographer for the Toronto Star newspaper. His assignments take him to Australia, Africa and Alaska, as well. His focus seems to be on the native people of these lands and how war, strife and “progress” affects them. After corresponding with Dan (Danny Wolohan), an American writer, he feels he has met a kindred spirit. Together they form a union and the story explodes from there. They both have had a troubled (to say the least) childhood and early adult life. Does this affect their view of the World and Life? Probably. But they acknowledge this. And that does not negate the fact that they are witnesses to some horrible atrocities and have the guts to report it, even at the risk of their own sanity. The play takes place over a period of time and several different locations. The twenty or so characters are played by just these two actors. And they do it exceedingly well! Goaded along, I’m sure, by not only the director, but also by the Dialect Coach, Mary McDonald-Lewis. The stark but versatile set, lighting and projections (Christopher Acebo, James F. Ingalls and Eamonn Farrell) also are extremely inventive and add immensely to the success of the style of this production. I cannot say enough good things about the actors. Playing all kinds of different characters and keeping it straight within their minds, as well as for audience, is extraordinary. Only a few times did I get confused momentarily as to who was who but, even then, they were quickly back on track. Some awards should be in the making for these Herculean efforts. And Bill Rauch’s adaptation and direction is outstanding. Recently he adapted and directed Medea/MacBeth/Cinderella for the Oregon Shakespeare Festival in Ashland. Combining these three stories on an essentially bare stage was a seemingly, even more of a challenge. But he pulled that off, too, with nary a misstep. His vision for this show is so intricate that one wonders how he did it and still managed to keep the drama flowing for his actors and audiences. But do it, he does, and with amazing skill and artistry. Another element to the story is Truth. One might be reminded of the blind men who try to describe an elephant. Each description is different, depending on what part of the elephant they have touched. The best one might expect in searching for this elusive element is one’s own truth to a situation (depending on one’s own background), not necessarily, the Truth. (See Kurosawa’s film, Rashomon, as an example). All things considered, the “elephant” is still there, it’s just our separate views of it that may differ. It should be noted that this play has some harsh language, adult situations and graphic photos. But it is a play worth seeing and a story worth considering. Bravo! Tell them Dennis sent you. Dennis Sparks wrote and directed the film Nightbumpers . . . email Dennis for more information. Follow Reviews by Dennis via Email! Please email Dennis at dojomos@gmail.com if you have any questions or would like to talk about using his reviews in your publications.